If the latest renderings are any guide, the 63 acres at Elitch Gardens could someday be home to towers that rival downtown Denver. Rhys Duggan, whose Revesco Properties bought Elitches in 2015 for $140 million, this week discussed preliminary plans to redevelop the area into a mixed-use project called The River Mile. Duggan said he wants to create a new neighborhood with everything from a school to a grocery store to parks along the Platte River. He described redevelopment as a 25-year project and said it’s still undecided whether Revesco — which purchased the site with backing from billionaire Stan Kroenke — would do the development itself or act as master planner. Duggan said the amusement park is staying put for now, although it will move at an undetermined time. Under the current campus-entertainment zoning, building height at the site is limited to 200 feet. Duggan said his firm hopes to go before City Council this summer to rezone the site for taller buildings. Duggan said the first thing to be built, on a portion of the existing parking lots, would be a parking garage. The garage would be large enough to house the carloads that flock to the amusement park in the summer and allow construction to begin on the remaining lots. 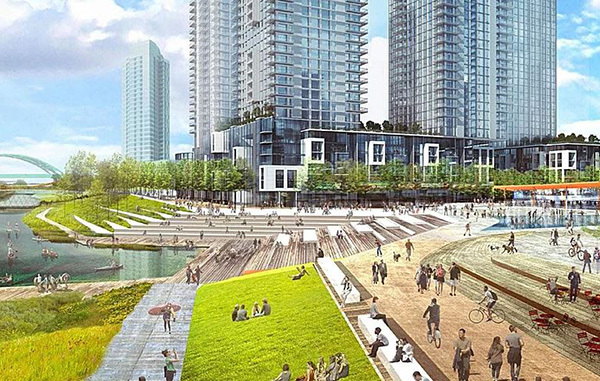 The renderings were drawn up by Denver-based Shears Adkins Rockmore and Vancouver-based Dialog. Revesco has a website for the project at rivermiledenver.com.